One of my favorite Sunday morning rituals is watching CBS Sunday Morning. I always find it thought-provoking, inspiring and ultimately calming… it’s good news and provides interesting little nuances and commentary that you can’t find anywhere else. 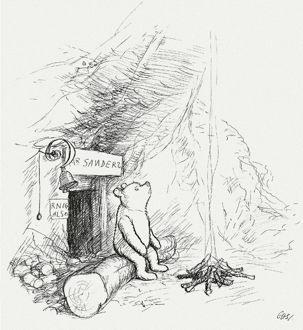 Featured this Sunday morning was a spot on the 86th anniversary of the publication of A.A. Milne’s first Winnie the Pooh book. I’ve always adored Pooh and his dear friends, but was especially fond of silly, bouncy Tigger. Most of the kids of my generation equate Pooh with Disney, on TV and in the movies, but especially TV… remember The Wonderful World of Disney at 7pm every Sunday night? I have such warm and fuzzy memories of leisurely Sundays finishing with an early dinner and bath before settling in on the worn gold shag carpet (yes, it was the mid 70s) to see what wonders Mr. Disney would bring us that night. Winnie the Pooh was one of my favorites, and I can still visualize the opening… panning through the nursery to A.A. Milne’s book which opened to an illustration that magically came to life. My parents and my little brother were always watching, too. Cherished family time that I now look upon wistfully as my own children are too old for gathering around a classic Disney flick. Nowadays it’s no easy task to spend family time with my 15-year-old daughter and 12.5-year-old son. They have very little in common and are too old for my old weekend-golf-widow standby of the latest kid matinee. In fact, they don’t really need mom to entertain them on the weekends, and I have a sneaky suspicion that even being seen with me isn’t so cool anymore. Just another reminder of how things change. How ephemeral each phase of life is, yet when you’re in the thick day-to-day of it, it’s hard to comprehend things being different. We think everything will be as it is now, forever. But we can’t stave off the change… we grow, we live, we learn, we lose those we love. The trick is to say good-bye to forever and let go of the past, and instead live fully in the moment. This is my new mantra.